Wadi Rum Nature Tours offer seven different tours in Wadi Rum lasting one day and one night including 4x4 tours, hiking tours, and camel tours. Overview: The most popular way to explore Wadi Rum; our 1 day jeep tour allows you to experience as much of Wadi Rum as is possible in one day. Price: 60 JD Per Person. Discounts are available for groups of 3 or more guests. Overview: Get to know the flora and fauna of Wadi Rum as you explore several beautiful canyons on foot. Price: 65 JD Per Person. Discounts are available for groups of 3 or more guests. 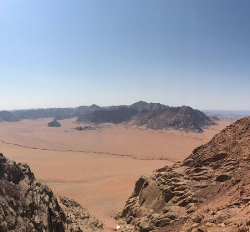 Overview: This 5 hour mountainous hike takes you to the summit of Wadi Rum's highest and most stunning mountain. Price: 100 JD Per Person. Discounts are available for groups of 3 or more guests. Overview: This is a leisurely hike with fantastic views of the Sabbit Valley and the many peaks of Wadi Rum. Price: 75 JD Per Person. Discounts are available for groups of 3 or more guests. One of the best known sites in Wadi Rum, the Burdah Arch scramble takes you 3 hours and 300 meters above the sand below. This slightly challenging climb is doable for any reasonably fit adult and makes for an exciting and adventurous day. In the evening you will enjoy Bedouin cooking and a lovely night under the stars or in our camp. All meals, transportation, sleeping equipment and guides are included in the price. 75 JD Per Person. Discount for more than 2 people. A moderate scramble, this adventure escorts you through the labyrinth that is Rakhabat Canyon. Surrounded by wild herbs and flowers, towering above bright red sand dunes, this hike is as beautiful as it is exciting. After a long day of hiking, you will enjoy a wonderful meal and a night under the stars or in our camp. All meals, transportation, sleeping equipment and guides are included in the price. 75 JD Per Person. Discount for more than 2 people. Overview: Explore Wadi Rum's famous sites using transportation used by the Bedouin for centuries: on the back of a camel! Price: 85 JD Per Person. Discounts are available for groups of 3 or more guests.